I work out often, and I’ve been trying to get myself to weight train more frequently. (<– was going great over my 2 month break from work, but hasn’t been happening as “regularly” as I’d like since going back to work). It seems difficult for my body to build muscle though. Lately, I’ve been wondering if I am just not getting enough protein before and after workout sessions. Recently, I read a study about weight gain, muscle gain, and overeating. In the study, all participants overate by 950 calories a day, but some maintained a high protein diet and the others a low protein diet. Throughout the study, their weight gain and body composition were analyzed. Both groups gained about the same amount of weight, but the group on the high protein diet gained muscle (and fat), and the group on the low protein diet LOST muscle and gained fat. I know from personal experience that I feel better when I’m eating a higher amount of protein. However, it doesn’t come easily to me. I crave carbs — oatmeal, fruit, smoothies, potatoes — yes, all healthy things, but carbs nonetheless. I could (and have) eat a completely vegetarian diet, and be 100% happy. And maybe if I wasn’t allergic to soy, lentils, peanuts . . . in other words, most of the great vegetarian protein sources . . . I would. But I am a big believer in listening to your body, and to feel my best, I have to focus on getting enough protein. I am not talking about body builder levels of protein here. 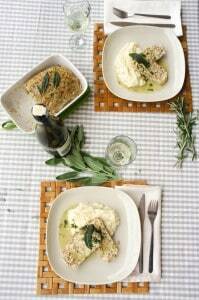 I am talking about getting the 60-80 grams of protein a typical woman needs. 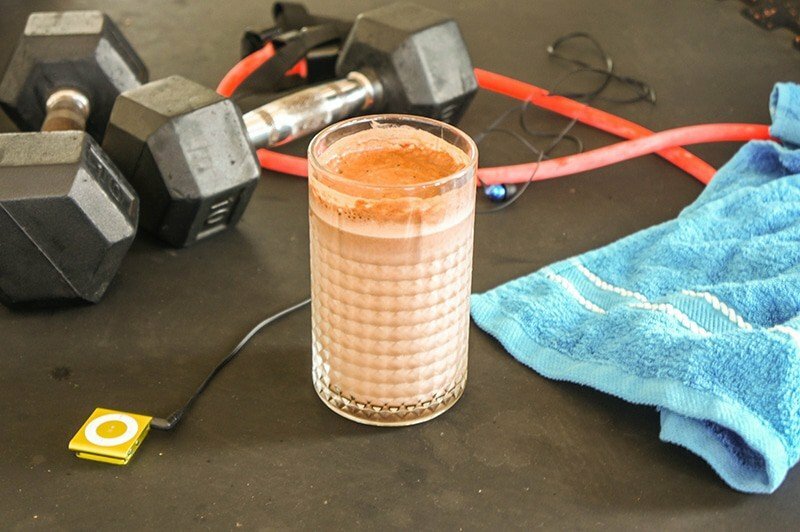 This muscle building non-dairy chocolate milk (sugar-free!) is one of my latest attempts! 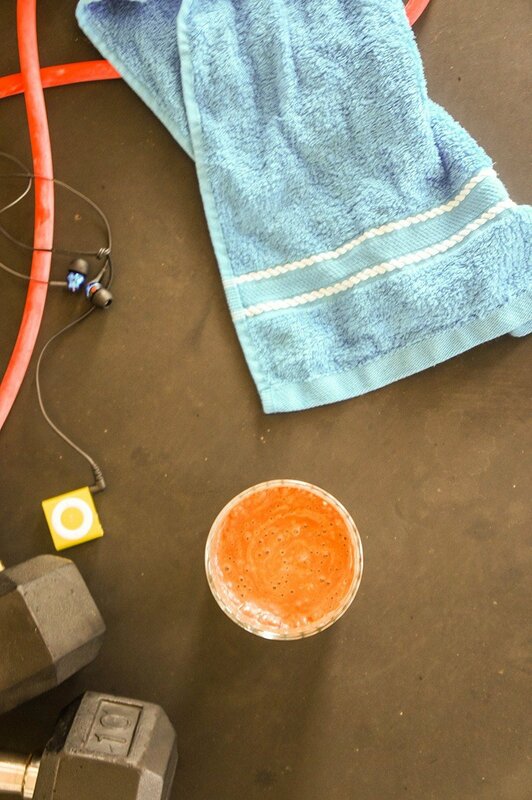 It’s perfect for after a workout — I don’t feel like eating a meal after a workout, especially a hard workout where my body really needs the boost of carbs and protein to rebuild itself. I rarely eat during the 30 minute-1 hour “recovery” window. While I can’t see myself starting to make myself do that, I can stomach chocolate milk. 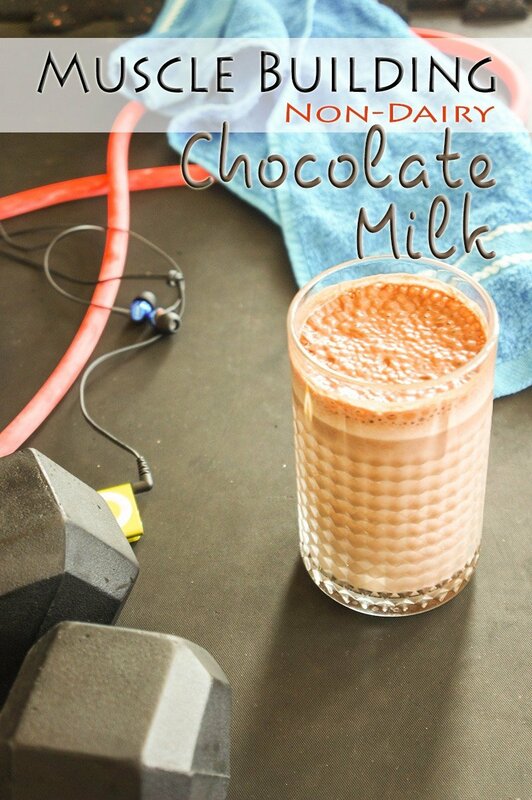 Chocolate milk isn’t a new idea post workout. It has never been an option for me because 1). I’m lactose intolerant, and 2). Why would I want to fill my body with SUGAR right after working out? This chocolate milk is made with non-dairy milk, and since almond milk doesn’t have the protein cow’s milk does, I supplemented with whey protein. I’m working on a post for later on why whey is my protein of choice, but any good tasting protein powder would work well here. Of course, eating protein from natural, unprocessed sources is always best. However, if you’re busy, and need more protein, it’s a perfectly healthy and reasonable way to up your protein intake. Yes, the whole egg is very healthy! Don’t stop eating whole eggs entirely! However, egg whites are a great low-calorie way to boost the protein of your breakfast (1 egg white has 4 grams of protein and only 15 calories). 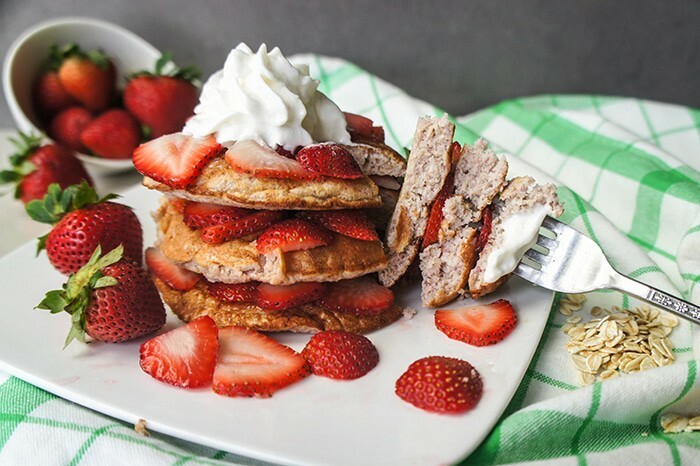 I love protein pancakes made with egg whites, and also toss egg whites into my oatmeal (when it’s almost cooked, add a couple egg whites while stirring). It makes a fluffy bowl of oatmeal, and topped with cinnamon tastes a bit like french toast! I also often hard boil eggs, and eat a couple of egg whites (or the whole egg) with an apple or cut veggies as a snack at work. I’m a big fan of making my meals higher protein, lower carb, by substituting low carb vegetables for typically high-carb side dishes. One of my absolute favorites is making “mashed potatoes” from cauliflower (if you STILL haven’t tried it, WHY NOT?). I’ve had quite a few blog readers comment that they were stunned at how creamy it gets! I also use cauliflower in place of rice (Mexi-Rice, Fried Rice, and Indian Turmeric Rice). I also love turnip in place of potato as a breakfast hash. This way, the total calories of the meal can stay low, and the serving of protein can be upped. Many gluten free flours are higher in protein than typical white wheat flour (3g protein per ounce). Starches are not. Although I occasionally use arrowroot powder, I prefer to use whole grain or non-grain flours. My favorites are almond flour or meal (6g protein per ounce), buckwheat (4g protein per ounce), and oat (5g protein per ounce). 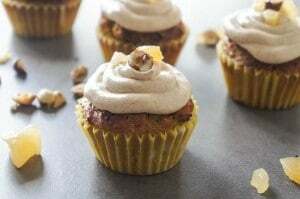 I also love coconut flour, which only has 2g of protein per ounce, but recipes calling for coconut flour use lots of eggs, which ups the total protein content of a recipe. Another trick? Use greek yogurt in place of creams, and low fat cream cheese in place of sugar in frostings. When all else fails, supplement! I can’t always guarantee I am going to have meat or eggs prepared for lunch. I am not always going to have time to sit down for a meal. As long as it’s not an every-day-every-meal occurrence, protein powder is a great option. I use protein powder most often for smoothies. I buy unsweetened, natural whey protein, because I don’t like the taste of artificial sweeteners, and would rather not put chemicals in my body. Also, when I am in the States, I pick up some Nu-Go Free protein bars. I am not recommending these because they blow me away. However, they are allergy friendly, and great for airplanes or really rushed days. A non-dairy chocolate milk, supplemented with protein powder. I use ½ of a date, because I don't like really sweet drinks. Use a whole, or even two, if you want to sweeten it more! Add a date (or 2) and ½ cup of almond milk to a blender. Blend until the date is fully mixed in. If your dates are hard, try softening them in hot water prior to this step. Add the rest of the almond milk, plus the cocoa powder and whey protein. Blend until frothy. Sometimes I also add an ice cube to make it super cold! What are your favorite tips for incorporating protein into your diet? Well, I like whey too for protein. Especially in the mornings. I tend to eat a lot of protein and build muscle very easily so that study you quoted makes a lot of sense to me. I eat very few carbs and listen to my body carefully. Except when it tells me to eat cookies and cake then I try to ignore it and grab an apple as fast as I can! 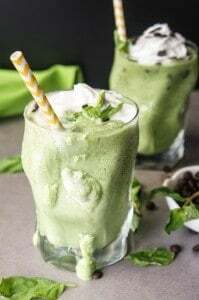 Love this protein shake for a post workout snack or just a snack when pulling the kids around in the wagon. I too find that it's important for me to get enough protein, otherwise my blood sugar crashes. I've been enjoying the whey powder as well. Oftentimes if I don't have time to sit down for a meal I just blend up some yoghurt, strawberries, whey powder, and a little stevia for sweetness. Fills me up for several hours and it's healthy! Yes, mine too! If I'm eating mostly carbs, I am just hungry all the time and don't feel good overall. I've never just added whey to my yogurt! That's a good idea, because I can't buy greek yogurt here very often. Stores here are starting to carry it, but a lot of the International brands of greek yogurt are very different from what we buy in the States- much lower protein content somehow. I wish I could do stevia- I have a crazy intolerance for it! A tiny bit makes me very sick. recently started testing the whey protein before your workout to the gym when I get usually eat enough protein and drink lots of water, for me is taking effect What do you think? Consuming protein after exercise compensates for the increased breakdown of protein in the body that occurs during training, while also providing it with the stimulus for muscle growth. Whey protein is ideal for post-workout recovery because it’s easily digested and has a high concentration of essential amino acids. Your point about supplementation is a nice one. When people do not have the time, this is an excellent alternative, as you shared. Protein powders are nice suggestions as well.